A unique take on kale salad from Gjelina – one of Los Angeles’s most talked-about restaurants, lauded by critics and beloved by stars, locals, and out-of-towners alike for its seductive simplicity and eclectic Cal-Med menu from talented chef Travis Lett. Tired of the usual kale salad? 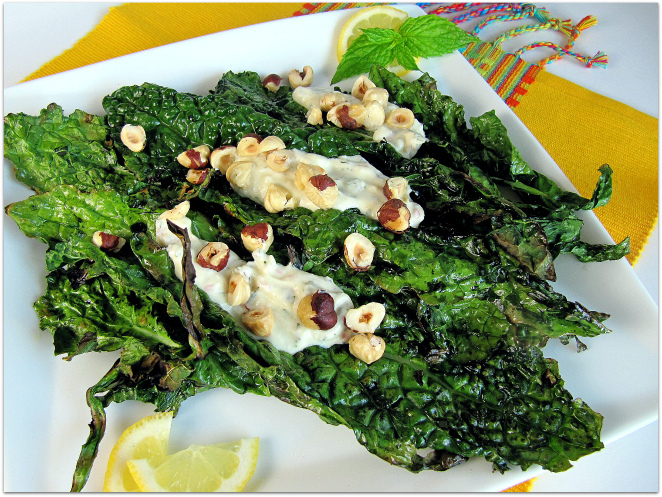 Try grilling kale – you will love how crispy the charred edges are – kind of like eating kale chips, and the tangy yogurt dressing is deliciously cool and refreshing with a satisfying nutty crunch from toasted hazelnuts. It’s a darn good thing that I’ve always been committed to cooking healthy, nutritious meals for my family since Day 1, because now it’s a life or death call to action. If I hadn’t been interested in health and nutrition since I was a teenager eating brewer’s yeast (what teen does that? ), been eliminating processed foods, sugar, and salt from our diet for over a decade, and making home-cooked meals nearly every night, then the recent turn of events would seem like an almost insurmountable task. The reason why it’s a darn good thing is it’s making the adaptation to my husband’s cardiologist-mandated strict low-sodium diet a little less brutal than if we were in the habit of drive-through breakfasts, fast food lunches, or takeout dinners on a regular basis. And, it’s still been tough because, although I diligently read labels, its amazing how insidious sodium is until you’re trying to consume less than 2,000 milligrams a day! A few slices of deli turkey (920 mg) with low-cal mayo (125 mg) between two slices of whole wheat bread (320 – 160 for each slice) with NO cheese, sounds pretty healthy, but has a whopping 1365 mg of sodium, nearly all of his daily recommended allowance of 1500 mg, and that’s just lunch! Fortunately, I discovered Low-Sodium Ezekiel bread which has 0 sodium and The Don is enjoying avocado, tomato, and cucumber veggie sandwiches several days a week. But let’s get to today’s recipe which I found online at L.A. Times Food after reading a very interesting article on how restaurants are cutting back on salt and hoping you won’t notice it. I was looking for a creative recipe for the kale that I picked up when shopping for ingredients for my Farmers Market Makeover entry and this was a unique take on kale salad. 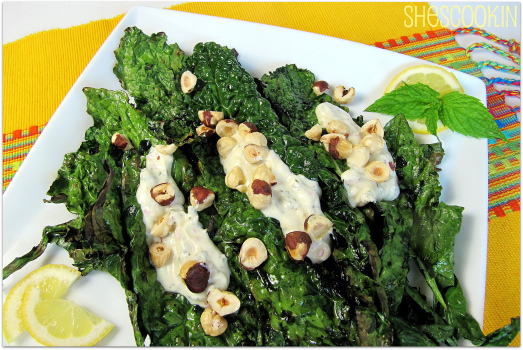 I loved how crispy the charred edges were – kind of like eating kale chips, and the tangy yogurt dressing was deliciously refreshing with a satisfying crunch from the hazelnuts. Heat the oven (or toaster oven) to 350 degrees. Heat your grill to medium-high heat or a grill pan over medium-high heat until hot. In a mixing bowl, combine the yogurt, shallot, garlic, mint, ¼ cup olive oil, red wine vinegar, and ¼ teaspoon each of salt and pepper. This makes about 1½ cups dressing, more than is needed for this recipe. The dressing will keep for up to 3 days, cover and refrigerate until ready to use. Place the hazelnuts on a rimmed cookie sheet and toast in the oven until fragrant and golden, about 8-10 minutes. Transfer the hazelnuts to a clean, damp kitchen towel and rub to remove the skins. Chop roughly and set aside. Place the greens in a bowl and lightly coat with the remaining 3 tablespoons olive oil. Lightly season with salt and pepper. Place the greens on the grill until edges are slightly charred, 1-2 minutes depending on how hot your grill is. Move the greens around to avoid burning and continue wilting for another minute or so. They should be slightly charred on the edges and softened in the middle. Remove the greens to a large bowl or platter. Top with desired amount of dressing and sprinkle with hazelnuts. Serve immediately. *Lett suggests Russian kale, I used organic Lacinato kale (also known as Tuscan, Dinosaur and Black kale) purchased at the farmers market. Oooh love this salad! Grilled Kale sound super delish and hearty! Thanks for sharing this- I am totally gonna make soon! Salad looks great! Sodium can be such a tough one to cut out – even if you are good at making well balanced meals! Good luck! Thanks, Erin – it has been a challenge! I am a kale lover so I’m bookmarking this one, I agree it’s a unique recipe that looks healthy and good. I need to branch out, no pun intended) and try some new veggie recipes, thanks for sharing- I hope your awareness of healthy eating rubs off on me! 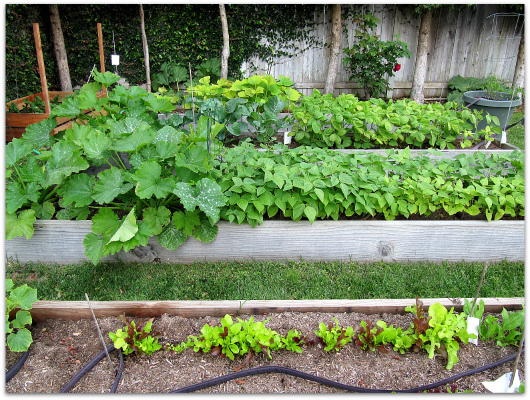 I wish I have a vegetable garden like this. In my yard, deer comes by and eat them all. I love this salad! So healthy and important to eat green daily! Yes, if you have deer, they can be a big problem! I’ve grilled lettuce and radicchio before but not kale! Great idea. Good luck to your husband on his new diet. A very different yet so delicious summer recipe! I like the extra addition of toasted hazelnuts on top. I’ve thought for some time restaurant food is too salty, glad they are cutting back. I would much rather have kale this way than the chips. Yum. I absolutely love the idea of grilled kale and I will be trying this soon! The hazelnuts are a brilliant addition too! I’ve been meaning to try this recipe! Love Gjelina and this dish looks so refreshing and creamy at the same time! What an awesome dish! I love kale and am looking for new ways to incorporate it into meals. Wow, out of all things that I have grilled (and that includes artichokes and asparagus) I never thought of grilling kale, but I like this recipe and am about to share it. Toasted hazelnuts are a favorite of mine, too. Talk about making a kale salad special!